Well it’s been more than awhile since I’ve made a nerdy craft for y’all, so I suppose it’s time I fixed that. 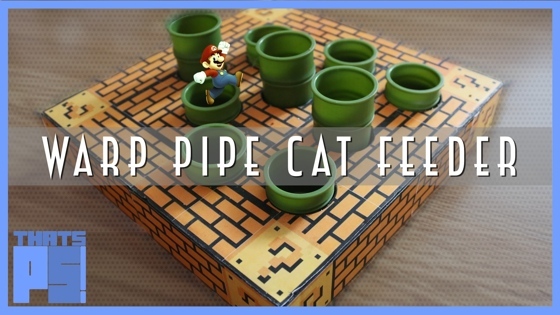 My latest video is up, and in it I show you how to convert an AiKiou Stimulo cat food dispenser into something a bit more Marioesque; A warp pipe cat feeder. I originally saw this dispenser over at NerdECrafters place, and thought it looks a LOT like the warp pipes from Super Mario Bros. So when I found one of the feeders at my local vets I decided I should really come up with a way to finish the job. You’ll need the cat treat dispenser, the pattern which needs to be printed on sticker paper, and some 3/16″ foam core. That’s about it. It’s Super (Mario) easy to put together, and it will make food time with the cats a whole lot more adorable. If they can figure out how to get it out that is. You might need to send in a plumber.